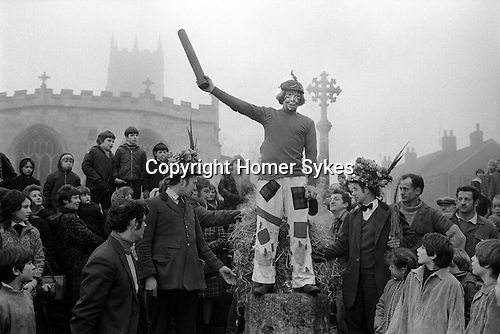 Haxey Hood Game. Haxey, Lincolnshire. Smoking the Fool. 1972. It is unclear how this rough version of rugby football began, it can only be traced with some certainty to an incident involving the first Lady de Mowbray who married John de Mowbray in 1298. One day when she was out riding her hood blew off and thirteen farm workers or ‘Boggins’ in the vicinity gave chase to it. When it was finally rescued by the ‘fool’ he was too shy to hand it over, so another Boggin (the ‘Lord’) gave it to her. Lady de Mowbray was so impressed with this gallantry that in her will she left a piece of land called the ‘Hoodlands’ to the village as long as the inhabitants promised to re-enact the event annually. Consequently, each year on the 6 January the people not only of Haxey, but also of Westwoodside and other surrounding villages, do so. There are thirteen Boggins, the lord and the chief Boggin wear hunting pink, the fool the attire of a court jester. After much singing of traditional songs in the village pubs, after lunch, they gather at the mounting stone by the village church where the fool makes a dash away from the crowd and the Boggins give chase until he is caught. They then carry him back to the stone where he tells the crowd the legend and the rules. is redeemed by the Boggins. Chief Boggin Arthur Clark & the Fool Peter Bee about to be smoked, the Lord is played by Stan Boor.